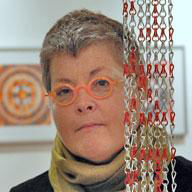 Pepper’s work has been seen in international and national venues including the UK, Japan, Canada, New York City and other gallery and museums throughout the USA including The Everson Museum of Art, The Schweinfurth Memorial Art Center, Munson Williams Proctor Art Institute, The Herbert J. Johnson Museum, and others. Pepper was born in Toronto, Ontario and currently resides in Cazenovia, NY. She is an Associate Professor at Cazenovia College and is their gallery director as well. She received a B.F.A from Maryland Institute College of Art and a M.F.A from the University of Connecticut.